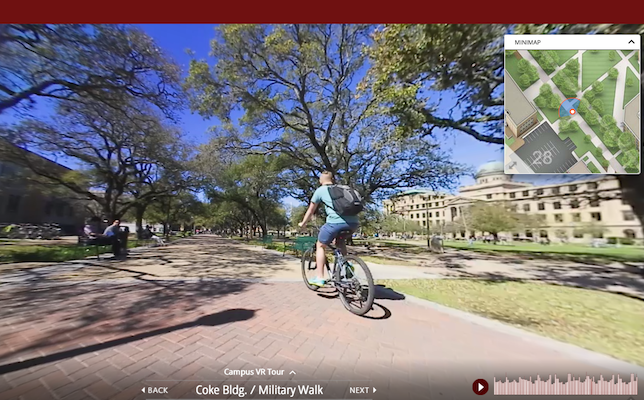 Texas A&M University is the latest campus to launch an immersive experience for visitors. The university recently introduced a virtual reality (VR) tour that offers users another way to visit the public university. The tour was designed on the Xplorer Virtual Tour system, powered by concept3D. The company previously built the Texas A&M’s interactive campus map, which launched in 2016. Xplorer Virtual Tour combines 360-degree panorama images of campus buildings, lecture halls and more with information about each location displayed in an on-screen text overlay. Users can orient themselves through the "Minimap” feature, an in-window map that shows their location and direction, and use the map to jump to and view other locations. They can also utilize the guided tour option with audio narration functionality. The Xplorer Virtual Tour is offered as a standalone virtual tour system, or it can added to concept3D’s CampusBird and atlas3D platforms. According to concept3D, the system makes it easy to add or update tour content at any time. Texas A&M last month debuted its VR tour at the SXSWedu conference in Austin, using headsets. Anyone can view the tour on desktop or mobile devices.